Long time no see, I hope everyone is gearing up for the cooler months. I envision myself planning tea parties, making homemade soups, sipping on hot chocolate, stocking up on slow cooker, bakes and casserole recipes. One such Zucchini bake recipe which was an instant hit at a recent potluck at a colleague’s place is what I would like to share with you all. Zucchini is relatively low in calories making it an ideal item to include when you are watching the scale. It is also high in folate, potassium and Vitamin A. 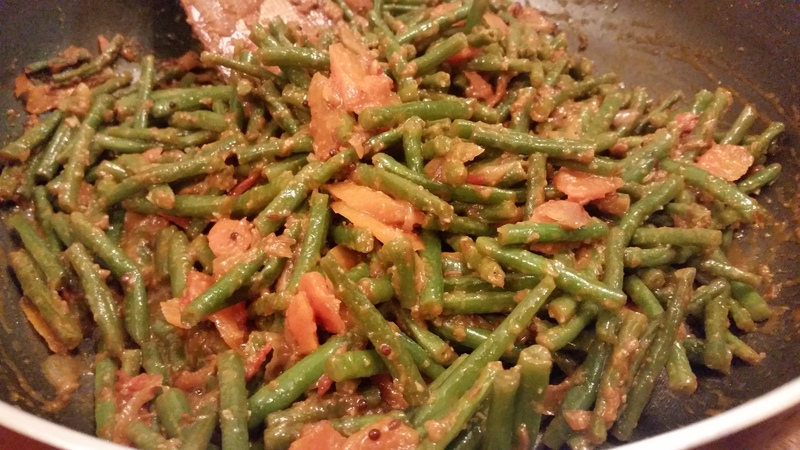 My earliest memories of eating zucchini are at a Mumbai eatery where I ordered Pasta Arrabiata with mixed vegetables. It had broccoli and some carrots along with some pretty unusual looking green strips. I enquired with the server about what were these green strips which made the overall dish rather pretty and delicious. And that’s how I was introduced to this beautiful vegetable. I love eating zucchini stir fried with other vegetables on most occasions. However in stir fries I feel like the wonderful flavor of this veggie does not shine through. Hence I decided to bake this on it’s own with the only exception being some cherry tomatoes and a couple of shallots. Line a flat baking sheet with foil and grease it well. In a mixing bowl, add all ingredients except cheese and coat them well with oil and seasoning. Layer the zucchini neatly on the baking tray and sprinkle parmesan cheese. Bake for 15 minutes at 170 degrees Celsius. I did not want to over do the cheese and baked it for a short duration so that the flavours of were given it’s due credit. Serve with any pasta dish or good to be eaten on it’s own. What do I pack for lunch tomorrow ? This is a question I ask almost every day to my dearest husband and he never has a good enough answer. He does not like to take leftovers of dinner last night as is. This leaves me in a fix! So I have to work a lot with leftovers in one way or another. Some days I use the curry or vegetable in parathas and make kathi rolls or if I have stir fried veggies, use them up in noodles. On most days, I have a bowl of left over rice staring back at me. When I am at leisure, I sometimes make Spicy Peanut Balls from leftover rice. 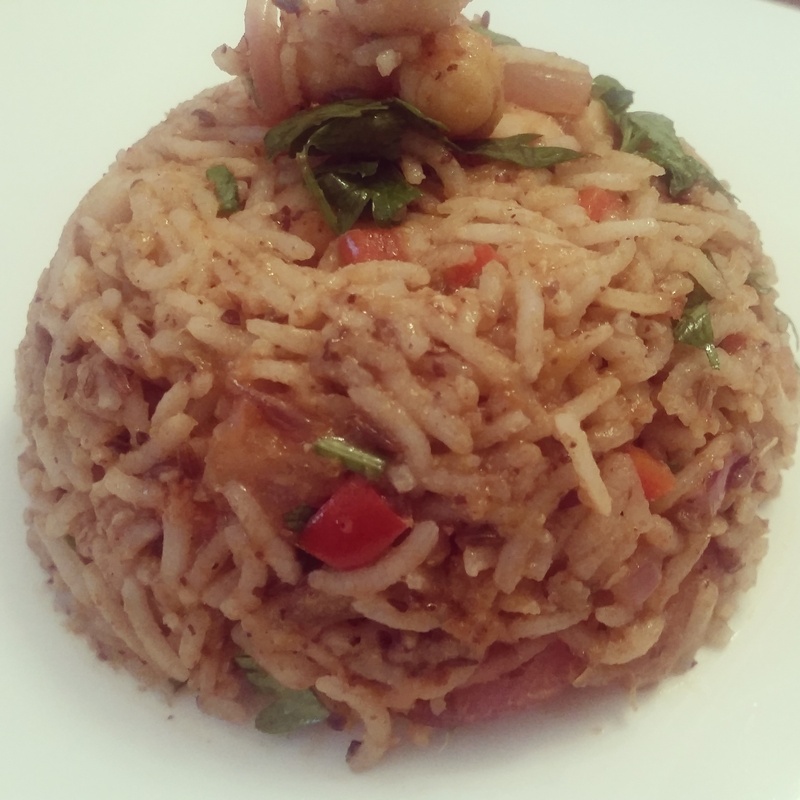 On one such instance, I made this rice with chickpeas and spices. This is a easy office lunch option, gets ready in few minutes and is very easy to prep. Chickpeas add a source of protein to an otherwise basic recipe. I used to always spice this up with the usual coriander and cumin powder. However this time around I decided to experiment with dukkah spice mix. Dukkah is an Egyptian spice mix comprising of toasted sesame seeds, hazelnuts, coriander, almond meal and cumin. I’m no expert about these spice mixes but just sharing the information imparted by my colleague’s mum! 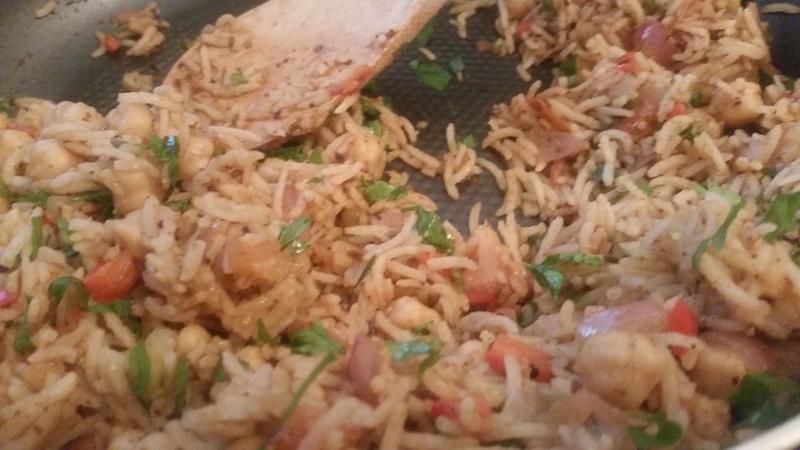 I have used chaat masala previously to add some zing to rice dishes like Tawa Pulao. This time since I was using a Middle Eastern spice mix, I decided to substitute the chaat masala with some sumac. And I’m glad that I did so! In a sauté pan, heat some oil and add cumin seeds and carom seeds. Once it sizzles, add green chilly followed by onions. Cook onions until they are translucent, add tomatoes. Let them cook till they are mushy. Add the spices, salt to taste and blend well together followed by chickpeas. Let it stand in the mixture for a while. Add the cooked rice and mix it well with the mixture. Garnish with parsley and serve hot with a side of cucumber raita. 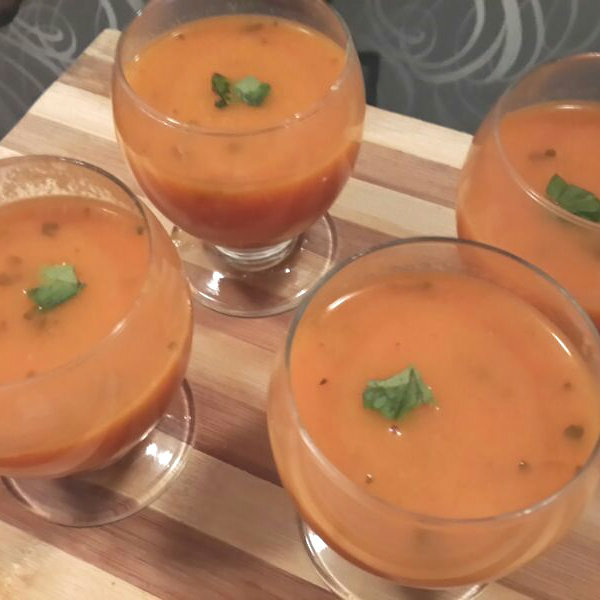 It’s getting cooler these days and what’s more comforting than a bowl of home made soup! At my parents home, having soup before meals is quite the norm. My grandfather was so very fond of having soups! And my mom used to ensure she serves him a variety to choose from. He loved every ounce of liquid from the vegetables which were just blanched or boiled. I remember him asking my mom to use the whey left from home made paneer to make dough for chapatis. Not wasting any nutrients from food was his mantra. He was also a great at recommending home made remedies and most of them worked. Yes! Even the weird ones worked much to our amusement. I have loved tomato soup since childhood. It’s got to be my favorite soup to order when at a restaurant. My love of tomatoes is evident since most of my recipes have one in them! He used to lovingly ask my mum or grandma to make this especially on days I was in low spirits. This is how dearly and selflessly he loved me. His first grandchild and perhaps the luckiest one who got to spend 27 glorious years under his wings. Well this is turning out to be quite an emotional post. 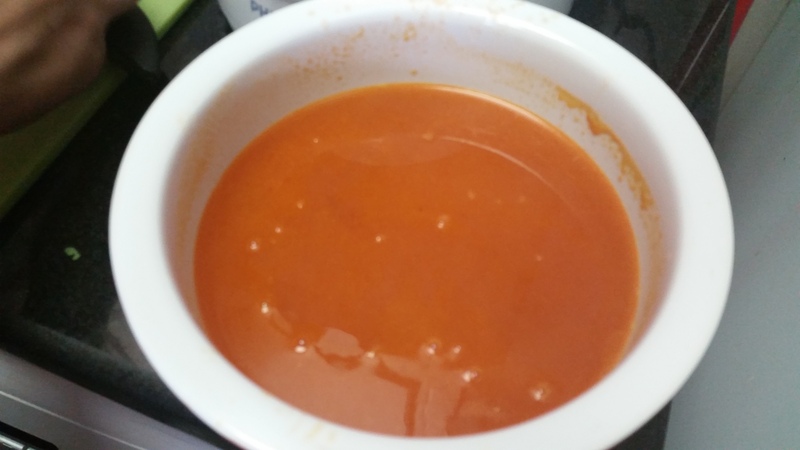 Let’s get on to the recipe of his favorite tomato soup. 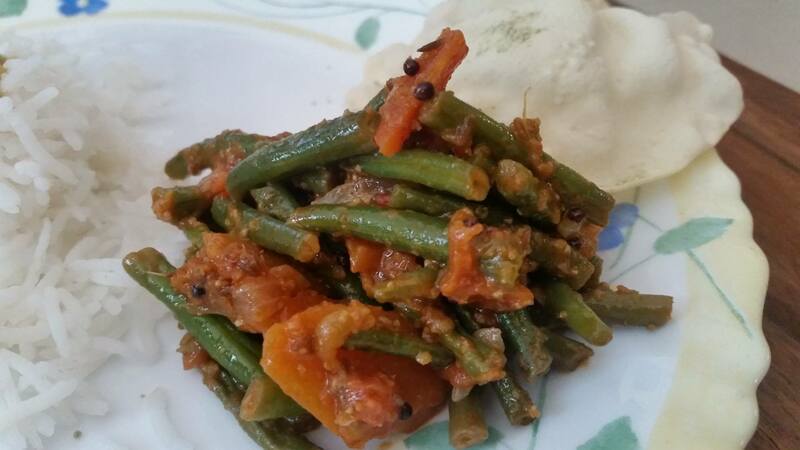 I have modified a popular Sanjeev Kapoor recipe as shown in Khana Khazana to my family’s liking. In a big pot, heat the oil and add bay leaf, peppercorns and sautee it for a minute. 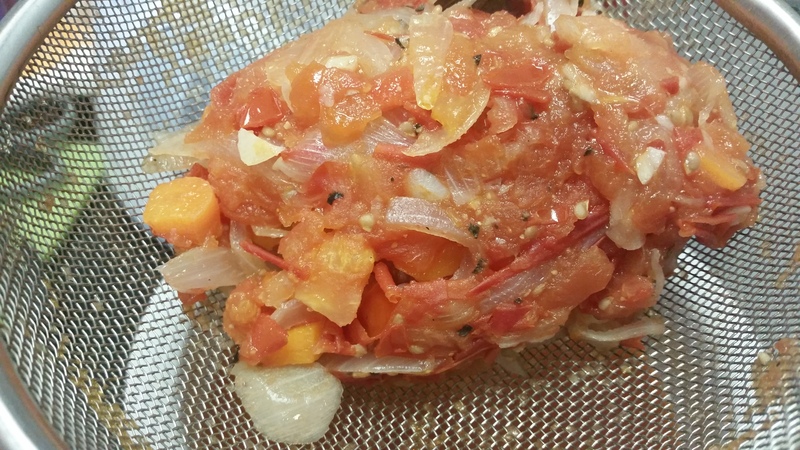 Add garlic cloves and cook them until the raw flavor goes away. Add onions, tomatoes and carrots and cook them they are soft but not mushy. Add water and let it simmer for 5-7 minutes. Take the mixture off heat and after cooling it for a while, strain the mixture. Reserve the stock on the side. Now in a blender add the strained vegetables with a little water to facilitate smooth blending. 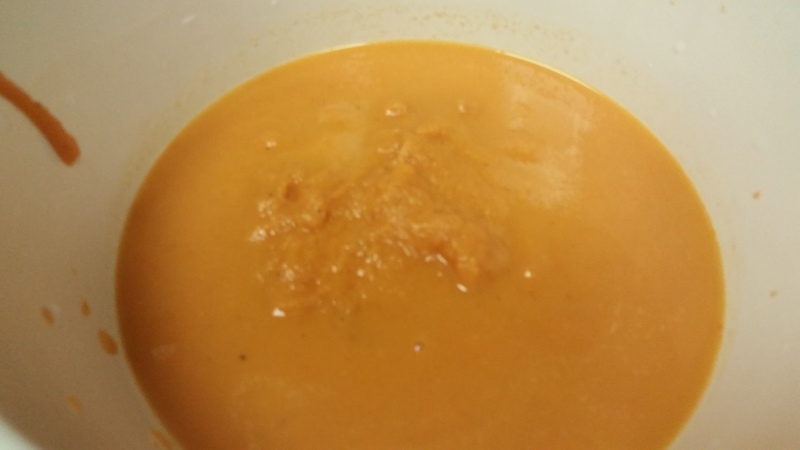 Once the mixture has blended well and is at a consistency you like, pour the puree back in the sauce pot and let it simmer. You could add tomato paste at this point of time if you prefer to enhance the color. Add salt and black pepper powder to taste, sugar and the stock set on the side and cook for another 10-12 minutes uncovered. 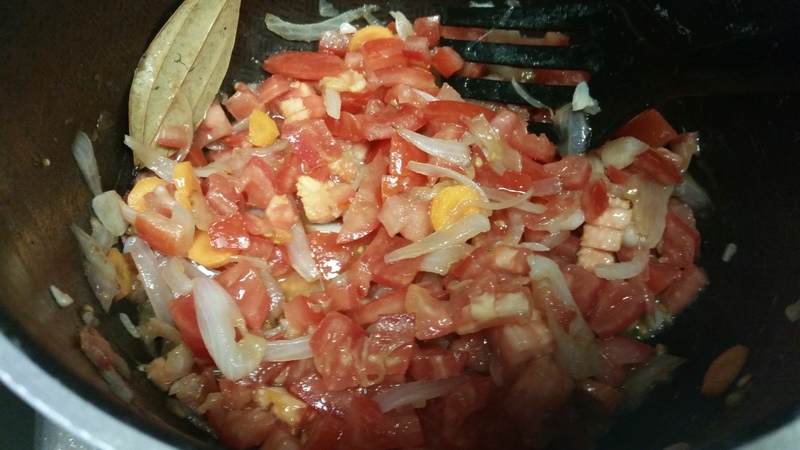 You can skip sugar from the recipe however I prefer adding the same since it helps to cut the sourness of the tomatoes. Once the soup reaches the consistency you desire. Take it off heat and strain once more. Serve with a drizzle of cooking cream and garnish with any herbs you prefer. Until next time happy cooking!